, Alfergani, or Fargani, was a celebrated Arabic astronomer, who nourished about the year 800. He was so called from the place of his nativity, Fergan, in Sogdiana, now called Maracanda, or Samarcand, anciently a part of Bactria. He is also called Ahmed (or Muhammed) Ben-Cothair, or Katir. He wrote the Elements of Astronomy, in 30 chapters or sections. In this work the author chiefly follows Ptolomy, using the same hypotheses, and the same terms, and frequently citing him. 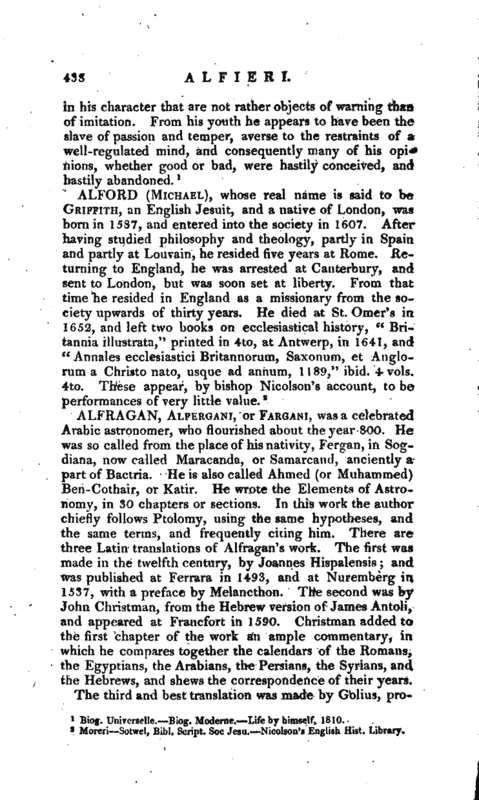 There are three Latin translations of Alfragan’s work. The first was made in the twelfth century, by Joannes Hispalensis; and was published at Ferrara in 1493, and at Nuremberg in 1537, with a preface by Melancthon. The second was by John Christman, from the Hebrew version of James Antoli, and appeared at Francfort in 1590. 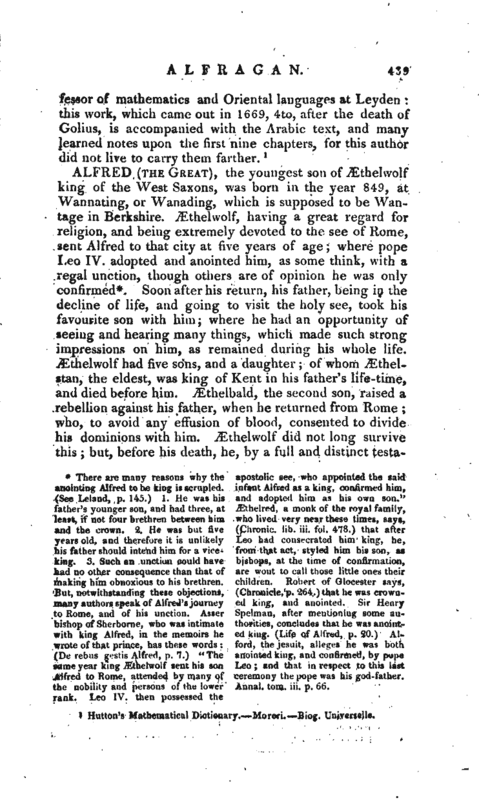 Christman added to the first chapter of the work an ample commentary, in which he compares together the calendars of the Romans, the Egyptians, the Arabians, the Persians, the Syrians, and the Hebrews, and shews the correspondence of their years. Hutton’s Mathematical Dictionary. —Moreri. Biog. Universelle.